Using the My RewardsTM Gold Debit Card for everyday purchases can be very rewarding! Now, it's even easier to earn more valuable items in your rewards program. Each purchase you make with the My RewardsTM Gold Debit Card, will earn you 2 points per $100. Remember, 100 points is all it takes to get a gift at the first level! You may redeem right away or save your points for bigger, better rewards in the future. For additional information on the benefits available, please click here. To view all the available rewards, log in or create an account at www.connexperks.org and select a Reward. Download My Rewards FREE app today for your iPhone®, iPad® or AndroidTM devices. Access the benefits of your My RewardsTM Gold Debit Card through your mobile phone with a direct link to your rewards account. iPad and iPhone are trademarks of Apple Inc., registered in the U.S. and other countries. App Store is a service mark of Apple Inc. Android is a trademark of Google Inc.
To Download the App click here. Shop online through the rewards website and earn cash back for your purchases. More than 100 popular online shopping sites participate. Earn an average of 2.5% cash back from online merchants like Walmart®, Best Buy®, Office Depot® and more! Cash back amounts vary by retailer. If you have a Gold or Platinum Debit Card, log in to your account at www.connexperks.org and click "Shop Online". Enjoy savings on dining, local attractions, shopping and more. Get discounts and coupons for the places you go most. Coupons are accessible through the rewards website and the My RewardsTM mobile app. So, no matter where you go in the United States, you’ll have access to the best area deals! If you have a Gold or Platinum Debit Card, log in to your account at www.connexperks.org and click "My Area Deals". With the My RewardsTM Gold Debit Card, you'll earn bonus rewards points when you shop online through the rewards website. With more than 100 popular online shopping sites, earning bonus points has never been easier. If you did all of your shopping online, imagine how close you could be to an iPod®, a plasma TV, a Caribbean Cruise, or even a new car! Bonus points amounts vary by retailer. My Rewards™ Rx Savings Card offers prescription savings for you and your family. Simply present the prescription card at one of the 60,000+ participating pharmacies any time you purchase prescription drugs that are not covered by insurance. Finding a pharmacy is easy: 8 out of 10 pharmacies nationwide accept your savings card. Pharmacy and Member Help Desk: (855) 899-5338. 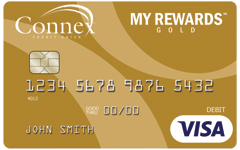 If you have a Gold or Platinum Debit Card, log in to your account at www.connexperks.org and click "My Rewards Card" and Rx Savings"
The My RewardsTM Gold Debit Card offers 24-hour roadside assistance, seven days a week, 365 days a year. This coverage consists of one event per year at $100. Whether you need a tow, a battery jump, fuel delivery, winching or a tire change, you're covered. To request assistance, please call (855) 899-5338. The My RewardsTM Gold Debit Card provides you with an extended warranty for eligible purchases (up to $10,000). This warranty doubles the original U.S. manufacturer warranty and any purchased warranty up to a maximum of 12 months. Enjoy savings on rental cars & hotel accommodations on widely-used, recognized brands across the country. If you have a My Rewards Debit Card, sign in to your account at www.connexperks.org and click "My Rewards Card" and "Hotel/Car Discount Codes". Misplace your card? Get a replacement quickly and easily by calling (855) 899-5338. My RewardsTM Debit Card holders may be eligible to receive reimbursement (up to $1,000) for eligible items that are damaged or stolen within 90 days of purchase. Using the My RewardsTM Platinum Debit Card for everyday purchases can be very rewarding! Now, it's even easier to earn more valuable items in your rewards program. Each purchase you make with the My RewardsTM Platinum Debit Card, will earn you 5 points per $100. Remember, 100 points is all it takes to get a gift at the first level! You may redeem right away or save your points for bigger, better rewards in the future. To view all the available rewards, log in or create an account at www.connexperks.org and click "Rewards". If you have a Gold or Platinum Debit Card, log in to your account at www.connexperks.org and click "My Rewards Card" and "My Area Deals". Shop online through the rewards website and earn cash back for your purchases. More than 100 popular online shopping sites participate. Earn an average of 5% cash back from online merchants like Walmart®, Best Buy®, Office Depot® and more! Cash back amounts vary by retailer. With the My RewardsTM Platinum Debit Card, you'll earn an average of 50 points per $100 when you shop online through the rewards website. With more than 100 popular online shopping sites, earning bonus points has never been easier. If you did all of your shopping online, imagine how close you could be to an iPod®, a plasma TV, a Caribbean Cruise, or even a new car! Bonus points amounts vary by retailer. The My RewardsTM Platinum Debit Card provides you with an extended warranty for eligible purchases (up to $10,000). This warranty doubles the original U.S. manufacturer warranty and any purchased warranty up to a maximum of 12 months. The My RewardsTM Platinum Debit Card provides numerous services when traveling, including emergency private medically-required transportation, medical assistance services, and family and personal travel assistance services. Maximum benefit amount is 100% of Covered Expenses up to $200,000 per Eligible Person per trip. To request assistance, please call 855-899-5338. The My RewardsTM Platinum Debit Card offers 24-hour roadside assistance, seven days a week, 365 days a year. This coverage consists of up to three events per year at $100 each. Whether you need a tow, a battery jump, fuel delivery, winching or a tire change, you’re covered. My RewardsTM Platinum Debit Card holders may be eligible to receive reimbursement (up to $1,000) for eligible items that are damaged or stolen within 90 days of purchase. My RewardsTM Platinum Debit Card holders may receive reimbursement for damage to or theft of eligible cellular wireless phones. * This coverage consists of up to two claims per 12-month period of up to $500 per claim with a $50 deductible applicable per claim made. Exclusive Rewards, Vacation Packages, Events, etc. Enjoy rewards at each level of the program that are reserved exclusively for My RewardsTM Platinum Debit Card holders. Electronics, special vacation packages and other high-end items will be available only to you. Periodically, we may offer special invitations to events that are only open to My RewardsTM Platinum Debit Card holders. As those events arise, additional information will be made available. 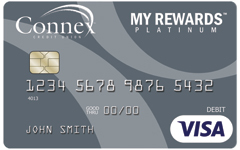 If you have a Gold or Platinum Debit Card, log in to your account at www.connexperks.org and click "Rewards". Download My Rewards FREE app today for your iPhone®, iPad® or AndroidTM devices. Access the benefits of your My RewardsTM Platinum Debit Card through your mobile phone with a direct link to your rewards account. For all program terms and conditions, please Click here . Congratulations on your decision to sign up for a My Rewards™ Gold or Platinum Debit Card! I HAVE A REWARDS ACCOUNT. If you already have a www.connexperks.org account, please log in and select Card Settings from the My Rewards Card menu. I DO NOT HAVE A REWARDS ACCOUNT.